Once the first port of call for transatlantic flights, Shannon Airport in the Province of Munster (in Irish Aerfort na Sionna, in IATA-code SNN, in ICAO-code EINN) is the third busiest airport in Ireland, after Dublin and Cork. Around 1.75 million passengers use Shannon Airport per year. Today, it mainly serves the towns of Limerick, Ennis, and Galway, plus the sizeable south-west of Ireland. Historically, however, Shannon Airport had a much more important role. Shannon Airport is no longer the first choice when it comes to catching long-haul flights, but it does operate several flights per day to the UK, USA and more. Naturally, flight plans change, as do company priorities, so any listings of destinations served from Shannon Airport can only represent a snapshot. At the time of writing, the following connections existed (not all on a daily basis, and excluding charter flights): Alicante (Spain), Berlin (Germany), Birmingham (UK), Boston (USA), Chicago (USA), Edinburgh (UK), Faro (Portugal), Frankfurt (Germany), Fuerteventura (Canary Islands, Spain), Krakow (Poland), Kaunas (Lithuania), Lanzarote (Canary Islands, Spain), London (Gatwick and Heathrow, UK), Malaga (Spain), Manchester (UK), New York JFK (USA), Newark (USA), Palma (Balearic Islands, Spain), Philadelphia (USA), Providence-Rhode Island (USA), Stanstead (UK), Stewart International (USA), Stockholm (Sweden), Tenerife (Canary Islands, Spain), Warsaw (Poland), Wroclaw (Poland), and Zurich (Switzerland). Airlines flying to and from Shannon Airport include Aer Lingus, Aer Lingus Regional, American Airlines, Delta, Helvetic Airways, Lufthansa, Norwegian, Ryanair, SAS, and United Airlines. Unless you are flying in, obviously, you’ll only be able to reach Shannon Airport by road. There is no rail connection. By car, the M7 and N7 will bring you here from Dublin, the M18 and N18 from Galway, the N18 from Ennis, the N21 and N69 from Kerry, the N20 from Cork, and the N24 from Tipperary and Waterford. Shannon Airport is well signposted, so you should run into no major problems. Spacious parking lots are available, check with the airport website for the best choice. By bus, Bus Éireann offers 136 connections to the rest of Ireland from Shannon Airport daily. Taxis are also available, though might be expensive on longer routes. A trip to Bunratty will set you back around €22 to Limerick or about €35 to reach Ennis. 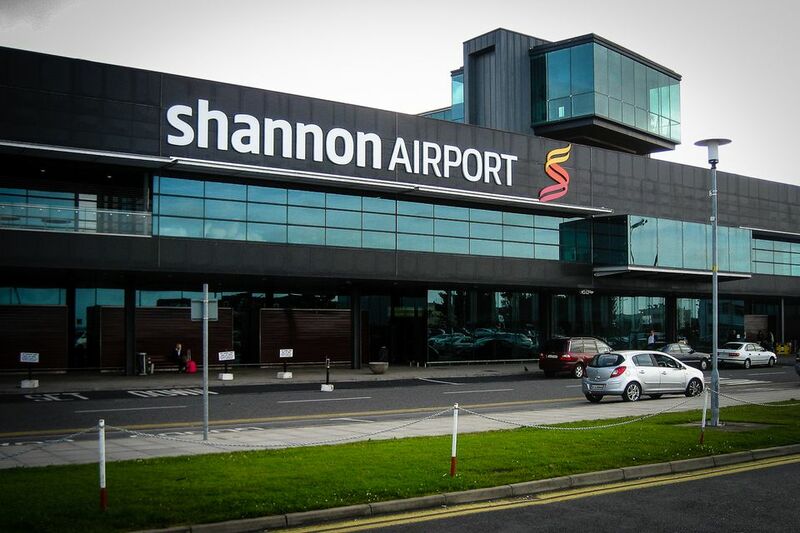 Even after an extensive renovation, Shannon Airport still is not much of a destination. The small but functional airport remains a transit facility but has some comforts to offer. The airport's greatest claim to fame may very well be the fact that in 1947, the world’s first ever duty-free shop was opened at Shannon Airport. Others quickly copied the idea, but small as the shop may be, it is the one that started it all. Brands on offer include Armani, Benefit, Chanel, Clarins, Gucci, Lancome, Marc Jacobs, and YSL, as well as Bunratty Meade, Jameson, Knappogue Whiskey, Pernod, and even original Irish smoked salmon. Another well-stocked shop is the Shannon Irish Design Store (located outside the security area), offering amongst others goods made by Aine, Aran Woollen Mills, Avoca Handweavers, and Foxford Woollen Mills. There is also a WH Smith store at the airport, which sells newspapers, books, and assorted travel goods. As for food and drinks—the Atlantic Café in the arrivals hall offers standard fare from 6 a.m. to 10 p.m., the Zest Food Market in the departures lounge has more of the same between 5:30 a.m. and 9 p.m. (takeaway options available). The newest restaurant, JJ Ruddles, serves Italian fare made with local Irish ingredients. For US-bound passengers, there is Harry's at Gate 8, a Café after pre-clearance which offers mainly coffee and croissants, sandwiches and pastries, from 7:30 a.m. to 12:30 p.m. (Remember that this requires a second trip through security so you won't be able to bring any drinks that you buy in the other part of the airport). For your final Irish experience, you might want to head to the Sheridan Food Pub in the departures lounge. Named after Joe Sheridan, who reputedly invented “Irish Coffee” in 1943—you can revive your spirits here 24 hours every day. Visitors who are going to the US from Shannon Airport will also go through US Customs and Border Protection pre-clearance right at the airport—saving a bit of time when you arrive in the states. Because you will have already had your passport checked, flights from Shannon are treated as domestic flights. And finally—all major car rental companies have a presence at Shannon Airport, though it is recommended to book ahead. Bunratty is just a 15-minute drive away, and Bunratty Castle and Folk Park are a tourist magnet. From renovated old cottages to “medieval” castle banquets, you’ll find it all here. Plus some touristy shopping, and pubs. Limerick City is roughly half an hour’s drive away, and a bustling city center. Have a look at the mammoth King John’s Castle, or indulge your cultural sense at the Hunt Museum. Also quite good for shopping, and not as overpriced as Dublin. Ennis is also about half an hour’s drive away, smaller and much homier than Limerick. The small town center, with narrow streets and colorful houses, invites for a leisurely stroll. Or head for the Clare County Museum in Arthur’s Row, with its eclectic and interesting collection on local history. The Foynes Flying Boat Museum takes you back in time and will make your next transatlantic flight seem so much more comfortable. But it takes time, the drive is an hour or slightly less. Take a look at the Foynes website for details. Life at Shannon Airport has not always been run-of-the-mill routine, there were some memorable moments. For instance, the gigantic Airbus 380 was tested at Shannon Airport—for its crosswind stability during starts and landings. This says something about the weather you might expect here. Due to the length of the runway, Shannon Airport was also amongst a designated emergency landing site for the Space Shuttle. Shannon Airport’s most famous moment, however, came with Russian President Boris Yeltsin, who on September 30th, 2004, was expected by a sizeable entourage of Irish politicians. While an advance party of Russian delegates, and virtually the whole political leadership of the Republic of Ireland, were shuffling their feet next to the runway, Yeltsin’s plane first circled the airport for an hour, then came into land. Finally, the door opened but Boris Yeltsin never appeared. After another delay an Aeroflot crew member informed first the Russians, who in turn informed the Irish, that the President was “unwell” and “very tired”. A few quick words were exchanged, and everybody drove (or flew) back home. Even today, the real reason for Yeltsin’s spectacular non-appearance is disputed—his daughter claimed a heart attack had struck mid-flight, though other sources hinted ominously at the Russian President’s long-standing fondness of vodka. Originally, transatlantic air traffic was made up of massive flying boats and a terminal was built at Foynes, on the south side of the Shannon Estuary. This has long closed down, but has now been turned into a museum. With improvements to conventional aircraft, however, a land-based runway and airport were needed. As early as 1936 the Irish government announced the development of a modest site at Rineanna—into the island's first transatlantic airport. After draining of the extensive boglands, the first airport was in operation in 1942, and named Shannon Airport. However, the runways were not suitable for transatlantic flights, this only came to pass during extensions around 1945, ready for full service right at the end of World War II. On September 16th, 1945, the very first transatlantic flight happened, during which a Pan Am DC-4, coming straight from New York, landed at Shannon Airport. On October 24th of the same year saw the first scheduled commercial flight, this time an American Overseas Airlines DC-4, used Shannon Airport as its European landing place. From humble beginnings, Shannon Airport really took off with the post-war boom in transatlantic travel. Note due to being in such a desirable location, or having all modern comforts – but mainly down to the fact that limited aircraft ranges still made refueling stops necessary. With Shannon Airport being the most convenient point before or after a transatlantic flight. This, and the fact that it was located ion a non-NATO country right in the middle of NATO, also made Shannon Airport very attractive for the USSR (there even were joint Soviet-Irish ventures here). Even when aircraft became capable of flying l onger stretches, the famous “Shannon Stopover” still existed—this mandatory, politically motivated interruption of flights ended only in 2007. Your Pet on an Irish Vacation? Not Without Passport!